1. What signs or symptoms make the diagnosis of ovarian torsion more likely? What factors in the patient’s history make you more suspicious for torsion? How useful is the bi-manual exam? Ovarian torsion is defined as a partial or complete twisting of the ovary around its vascular pedicle and ligamentous supports. More completely, it is defined as adnexal torsion when the twisting includes the fallopian tube. The fifth most common gynecologic emergency, adnexal torsion has a reported prevalence of 3% (Cicchiello, 2011). Classically, a woman of reproductive age presents to the emergency department complaining of sudden, sharp, localizable lower quadrant pain, with tenderness to palpation, and a palpable mass on pelvic exam. How often then do patients present classically? One fifteen-year retrospective review found 90% of patients presented with lower quadrant pain, and 59% reported a sudden onset of pain. Almost half reported a previous history of similar pain. Nausea and vomiting were reported in 70% of cases. Overall, however, this study, and others like it, found the history of present illness to be rather insensitive, with lower abdominal pain being the only reliable symptom. The physical exam proved to be even less reliable. Only 3% of patients with surgically proven torsion were found to have peritoneal signs, with almost 30% having no tenderness to palpation and even fewer having a palpable mass on pelvic exam. Fevers were exceedingly rare in these reviews of proven torsion (Houry, 2001; Mashiach, 2011). Others have looked specifically at the pelvic exam to determine its reliability and found it to be rather unhelpful, particularly the adnexal exam. One study of emergency department physicians found an inter-examiner reliability of only 23% for detection of pelvic masses, and only 32% for the presence of adnexal tenderness (Close, 2001). Gynecologists do not appear to fare much better in finding adnexal masses and other abnormalities on bi-manual exam. One study demonstrated a sensitivity of only 21-36% for detecting pelvic masses by gynecology attendings and residents performing pelvic exams under anesthesia (Padilla, 2000). Regardless of expertise, the pelvic exam does not appear likely to be particularly useful in diagnosing, or ruling out, torsion. Thankfully for the diagnostician, there are several patient risk factors that make torsion more likely. Although torsion can occur in any age group, it is much more common in women of reproductive age. Ovarian masses are highly associated with torsion and have been reported in up to 73% of cases. Masses greater than 4 or 5cm pose a significant risk by causing the ovary to swing and twist on its vascular pedicle. Much larger masses (greater than 10cm) are thought to be less likely to cause torsion, secondary to fixation to adjacent structures. Almost exclusively, the masses associated with ovarian torsion are benign, with dermoid cysts being the most common. Pregnancy also poses a significant risk for torsion with the greatest risk occurring in the first trimester and immediately post partum. In fact, approximately 20-25% of all cases of torsion occur in pregnancy. Finally, ovarian hyperstimulation syndrome after fertility treatment, causing multiple enlarged follicles, also increases the risk of torsion (Cicchiello, 2011; Chang, 2008; Vandermeer, 2009). 2. Time is ovary? If a patient presents to the ED 24 hours after the onset of pain, is the ovary salvageable? “Time is tissue” is a mantra that has been applied to various ischemic processes, including adnexal torsion. However, there does not seem to be a direct relationship between symptomatic time and ischemic tissue damage in torsion. The explanation for this discrepancy lies in the pathophysiology of torsion and in ovarian anatomy. The twisting of the ovary or fallopian tube around the vascular pedicle leads first to lymphatic and venous obstruction followed by obstruction of arterial flow. Additionally, ovaries have a dual blood supply, the uterine and ovarian arteries, protecting against complete ischemia. As a result, patients can experience significant pain from torsion while still maintaining adequate arterial blood flow to the ovary (Cicchiello, 2011). Multiple studies have tried to determine the critical ischemic time for torsion, beyond which preservation of the ovary is less likely. One study in a rat model showed preserved ovarian histologic structure at 24 hours, with irreversible ovarian damage only occurring after 36 hours of ischemia (Taskin, 1998). Clinical studies in humans have also looked at ovarian viability in cases of surgically proven torsion. In the largest study, comprising 102 patients, and a mean symptomatic time of 16 hours, most of the patients with surgically proven torsion had preservation of ovarian function after detorsion. This was demonstrated via multiple modalities. Ninety one percent had ultrasounds showing normal ovary size and follicular development after surgery, and 92% who subsequently required laparotomy/laparoscopy showed grossly normal appearing ovaries. Furthermore, although the sample size was small, 100% of patients who later underwent in-vitro fertilization using oocytes from affected ovaries were able to conceive (Oelsner, 2003). Additionally, one small clinical study showed preservation of ovarian histological structure with duration of symptoms less than 48 hours (Chen, 2001). In summary, based on the available literature it appears difficult to predict ovarian viability based on the duration of symptoms in a patient with adnexal torsion. Animal studies have shown ovarian viability time to extend beyond 24, and perhaps up to, 36 hours. Human studies also suggest extended ovarian viability, possibly beyond 24 and up to 48 hours after the onset of symptoms. It should be noted, however, that these studies are small and the disease process is variable. 3. What imaging modalities do you use to diagnose ovarian torsion? How good are these modalities? Ultrasonography (US) is the primary imaging modality for evaluating ovarian torsion. It is readily available, non-invasive, cost effective, accurate and does not expose the patient to ionizing radiation. There are two primary modes of ultrasound used: gray-scale and Doppler. Gray-scale mode ultrasound is used to visualize static ovarian anatomy but can be very useful in diagnosing torsion, with specificities ranging from 93-100%. In torsion, the ovary typically appears hypoechoic secondary to edema from obstructed lymphatic or venous flow. Frequently this congestion pushes the follicles to the periphery of the ovary. Although this is not specific for torsion, it is reported in up to 74% of cases. The most common finding is unilateral ovarian enlargement, usually greater than 4 centimeters. Additionally, an ovarian mass or free fluid around the ovary, or in the pouch of Douglas can be appreciated if present (Mashiach, 2011; Chang, 2008; Vandermeer, 2009; Graif, 1988; Nizar, 2009). Doppler mode ultrasound findings are more variable and dependent on the degree of vascular compromise. Absence of venous and arterial flow is the most specific finding. Lack of arterial flow has a positive predictive value of 94%, but represents a very late finding of what may be a non-viable ovary. Contrary to popular parlance, it is not necessary for the diagnosis. Normal arterial and venous Doppler scans have been documented in multiple torsion studies, with rates of normal Doppler scans with surgically proven torsion of 13% and 33% in two studies. This discrepancy between ultrasound findings and true disease process can be explained by early or intermittent torsion, a variable degree of twisting, operator skill, and the dual arterial blood supply. Doppler mode ultrasound is therefore of limited diagnostic utility. If gray-scale mode ultrasound suggests torsion, the diagnosis should never be excluded based on a normal Doppler study (Mashiach, 2011; Houry, 2001; Vandermeer, 2009). Combining both gray-scale and Doppler modes provides an additional tool for evaluation of torsion via the “whirlpool” sign. Coiled or circular vessels on Doppler, within a tubular or beaked mass on gray-scale, constitutes the “whirlpool” sign. 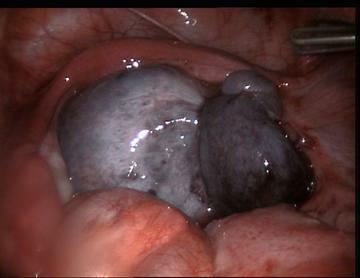 It is thought that this may be a positive prognostic indicator of a viable ovary as studies have reported intra-operative identification of necrotic ovaries in the absence of this sign (Chang, 2008). Ovarian torsion may also be diagnosed on CT or MRI, although ultrasound should be the primary imaging modality if torsion is the leading diagnosis. CT is less specific for torsion and carries the additional burden of radiation exposure, while MRI is not often readily available in the emergency department setting. These modalities are more appropriate when investigating alternative diagnoses such as chronic torsion or pelvic masses. Common findings on CT and MRI in acute ovarian torsion include the presence of an adnexal mass, a large displaced ovary, deviation of the uterus towards the affected side, obliteration of the fat planes, thickening of the fallopian tube and finally, ascites. T1-weighted fat suppressed MRI images demonstrate a bright ovary in the setting of vascular congestion or hemorrhage, which is highly suggestive of torsion if a thickened fallopian tube is also present (Chang, 2008; Vandermeer, 2009). 4. Do you consider torsion if imaging reveals a normal ovary? In which patients do you worry about torsion of an otherwise normal ovary? When do you insist on this diagnosis with your Ob-Gyn colleagues? Torsion of an otherwise normal ovary is rare. As discussed above, ovarian cysts are found in most cases of torsion. Other causes of torsion include an exceedingly mobile fallopian tube or mesosalpinx, elongated pelvic ligaments, fallopian tube spasm, or abrupt changes in intra-abdominal pressure. Although ovarian masses remain the primary risk factor for torsion, children and adolescents are more prone to torsion in the absence of a mass. Torsion in these cases is thought to result from hyper-mobile adnexae (Cicchiello, 2011; Chang, 2008; Mordehai, 1991; Davis, 1990). Ultimately, torsion is unlikely if ultrasound reveals a completely normal ovary without a mass, but as detailed above, ultrasound negative torsion does occur and there is no good data for the sensitivity of ultrasound in torsion. As with any disease that carries significant morbidity, a compelling history and concerning physical exam should not be ignored based on negative diagnostic testing. Further investigation of torsion, including urgent Gynecology consultation, advanced imaging, repeat ultrasound, and in some cases, laparoscopy, should be insisted upon in patients with increased risk of torsion or atypical torsion, such as pregnant or post-partum patients, pediatric patients, or in patients in whom an alternative diagnosis is not found. This entry was posted in Uncategorized and tagged gynecology, ovarian torsion. Bookmark the permalink. Awesome info!! I enjoyed this article so much. I’m a registered diagnostic medical sonographer with a specialty in OB/GYN.